Whenever you are training the time just seems to fly by, you don’t realise how much you actually spend preparing yourself for some of the most important races that will kick start your international orienteering career. So far I have managed to fit in both university study and training, however I should probably study a bit more. Exams are in a few weeks! 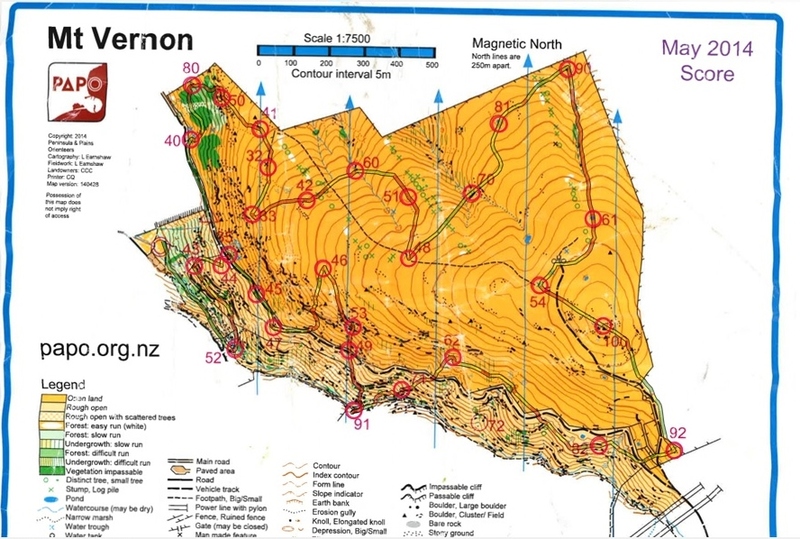 Over the weekend I ran in a Score Event at Mt Veron in Christchurch, its somewhere in the Port Hills. I choose to do the 75minute score event with the other option being 45minutes, the longer the better, training wise that is. Mass start began at 11.20am on Sunday, with most heading down the road to control 40. By the time I got to 41 everyone was well spread out and it was much easy to focus on your own race. As the terrain was open farmland with patches of scattered boulders and cliffs, predominately the south of the map, this area was somewhat physical with steep ascents. I set out to focus mainly on route choice, as it was quite easy navigation throughout the course I knew where I was going 95% of the time and managed to get all but one control. Hardest leg was the climb from 90 to 61. I think I prefer terrain like this, which has a physical aspect in it whether it is steep or just has patches of thick vegetation. The only route choice I am not so pleased with was from 46 to 47, not sure what I was doing but I may have gone on a wrong compass bearing or I was just running in the general direction of the road. Here is my GPS route! From 82 I should have contoured around the hill side to 72 (the control I missed) by aiming off from the patch of green, then headed to the road and aim of the fence to 62. I came in at 1:05:01, scoring 1715pts, while fellow team mate Ed Cory-Wright flew round the course, finishing in 53.17 managing to get all the controls and scoring 1790pts. Well done! Thank you PAPO for organising such a successful event and the Harrison’s for putting the controls out. From now till JWOC, there is still much training to be done, the days are getting slightly colder down in Canterbury, but this is not an excuse to hide from training! Each day leading up to JWOC week is something to look forward to! Currently my training is a mixture of long runs, speed work including time trials and fartlek. I try to have a variety as this works best for me but need to find a few more hills. Heights of Winter Rogaine is the next big event on the 14th of June down in Canterbury, I am planning to run the 6hr event with Sophie Harrison, so this should be an adventure, never done a Rogaine longer then 90minutes before!